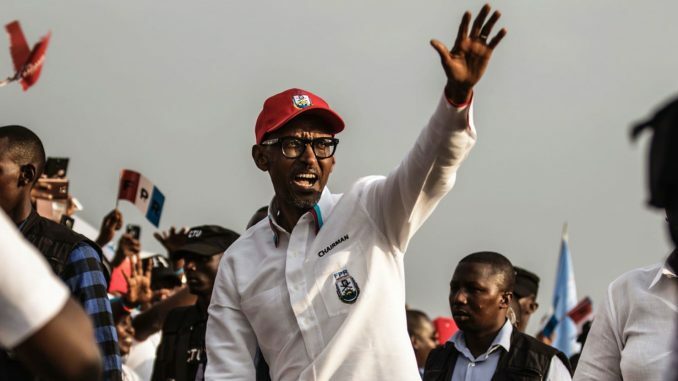 Elections are a mere ‘formality’ for Paul Kagame. He brought stability in the wake of atrocity, but does that make him any more a democrat, or any less an authoritarian? For decades, he has been sliding toward authoritarianism, and his name has been synonymous with Africa’s bloodiest wars. Having put an end to one genocide, he has since shared responsibility for the death of hundreds of thousands of people. Yet this man who helped force leaders of Uganda, Rwanda, and Congo (which was then called Zaire) out of power, and now oppresses many of his own people, somehow manages to win the applause of the West. Because Rwandans were the victims of horrendous massacres before he took over, he has sympathy; because his economy has prospered since, he has admiration. He has brought stability in the wake of atrocity, but does that make him any more a democrat, or any less a tyrant? One is hard pressed to think of any tyrants of recent vintage, from Fidel Castro to Saddam Hussein, who would claim such phenomenal numbers. (Close, yes, but not quite 99 percent.) Yet for years, Kagame has won effusive praise from the democratic West. That’s the typical language Western leaders like to use to describe Rwanda under Kagame, especially when lavishing torrents of foreign aid on the tiny African nation. Yet Cameron’s comments came just after the United Nations released a devastating report (PDF) that accused Rwanda of effectively masterminding a murderous rebellion in the neighboring Democratic Republic of the Congo (DRC) which forced half a million people from their homes. Despite being aware of Kagame’s human rights atrocities, Cameron said it was “right” to continue pouring aid into his regime. And he isn’t the only leader to think highly of Kagame. It doesn’t just end in praise. An estimated $1 billion is spent annually on foreign aid to Kagame’s government. The United States provides close to a fifth, followed by the U.K. which has so far this year given £64 million (about $84 million) in aid. Germany and the Netherlands give substantial aid to Rwanda as well. One can run down a checklist of the good that Kagame has done, and it is considerable. His investment in agriculture in the last two decades has yielded positive returns. The country has had an annual growth rate of 8 percent since 2000, becoming one of the fastest growing economies in the world. Tea and coffee exports are soaring, thanks to reforms in the agricultural sector. Life expectancy, literacy, primary school enrolment and spending on healthcare have all improved, partly due to foreign aid that often is used judiciously. Rwanda has succeeded in reducing poverty levels from 57 percent in 2005 to 45 percent in 2010, although 63 percent of the population still live in extreme poverty. Rwanda has become, as well, the most female friendly nation in the world, especially in the area of politics. Close to 64 percent of parliamentarians are women compared to about 22 percent worldwide. Women are now able to own land and girls can inherit from their parents, which wasn’t the case some years back. But the good that’s been done does not make the bad any less sinister. And often when things appear great in Rwanda, someone else is paying the price. For instance, on the streets of the capital, Kigali, there are no beggars, no hawkers, and no prostitutes operating in the open. According to Human Rights Watch (HRW), Kagame’s men have rounded them up and put them in “transit centers” where they are held without charge and beaten with sticks. Executions were carried out by soldiers who accused the victims of stealing items like bananas, a cow, or a motorcycle; smuggling marijuana; illegally crossing the border from the Democratic Republic of Congo into Rwanda, or of using illegal fishing nets. Witnesses who saw the bodies soon after the executions told HRW that they saw bullet wounds and injuries that seemed to have been caused by beatings or stabbings. One victim had been stabbed in the heart; another had a cord around his neck. HRW also found that residents followed orders from authorities to kill suspected thieves, and many were beaten to death. In public meetings, authorities reportedly declared that they were following “new orders” which called for the killing of thieves and other criminals. Some of these killings were carried out in front of multiple witnesses, but they are rarely discussed in public. No local media outlets have reported about them, and local human rights groups are too afraid to publish any information on such issues due to the the strict restrictions on independent media and civil society in Rwanda. Even HRW, which revealed the atrocities, can’t operate freely in the country. Talk of extrajudicial killings in Rwanda should not come as a surprise to anyone, not even to liberal supporters of the regime. After all, President Kagame’s life has been full of wars, executions, oppression, and conspiracies. When Paul Kagame was two years old, violence began in Rwanda between the Hutu and the Tutsi, two of the three major ethnic groups in the country. The conflict led to the Rwandan Revolution, which saw the country transition from a Belgian colony to an independent Hutu-dominated republic that was hostile to the Tutsi people, forcing more than 100,000 to seek refuge in neighboring countries. Kagame’s family fled to Uganda, where he spent the rest of his childhood. At 24, Kagame joined a tiny group of Ugandan rebels led by Yoweri Museveni. Years later, he helped Museveni topple the government of Uganda. Museveni then became president (a position he has held now for 31 years), and Kagame was appointed his head of military intelligence. Kagame used that opportunity to build a network of Rwandan Tutsi refugees within the Ugandan military, with the eventual goal of invading Rwanda. Three years later, Museveni demoted Kagame after facing huge criticisms in Uganda over his appointment of Rwandan refugees to major positions in his government. Kagame then joined forces with the rebel group Rwandan Patriotic Front (RPF) to oust President Juvénal Habyarimana, a Hutu, whose regime was hostile to the Tutsi. When the leader of the group, Fred Rwigyema, was killed three days after the RPF began its uprising, Kagame—who was in the U.S. attending a course at the Command and General Staff College in Fort Leavenworth—flew back to take charge. Kagame’s RPF fought the government’s Hutu forces for three years until 1993 when a ceasefire was reached, but that didn’t last long as Hutu officers, plotted the extermination of every Tutsi in Rwanda. When a plane carrying Habyarimana, was shot down by unknown assassins in April 1994, a military committee that took immediate control of the country started right away murdering Tutsis and also Hutus who were opposed to the regime in what became the Rwandan Genocide. Within three months more than 800,000 Tutsi and politically moderate Hutu were killed in coordinated attacks. A year later, the genocide ended. Kagame had successfully taken the génocidaires out of power and pushed them into Congo (then known as Zaire). When they regrouped and began to carry out little raids in Rwanda with the support of long-time Zaire dictator President Mobutu Sese Seko, Kagame responded by invading—pitching his tent with the newly created rebel group, the Alliance of Democratic Forces for the Liberation of Congo (ADFL)—aiming to oust Mobutu and install Kagame’s ally, Laurent-Désiré Kabila, as his successor. At the end of what was known as the First Congo War, about 222,000 Rwandan Hutu refugees were either killed or missing. The atrocities were blamed on the Rwandan Defense Forces and the ADFL, which were determined to eliminate any military threat to the Kagame government. But a short time after Kabila took power from Mobutu, the new Congo leader fell out with Kagame, and—like Mobutu—began to support the génocidaires. This time, Kagame responded by throwing his weight behind a new rebel group, the Rally for Congolese Democracy (RCD), and launching the Second Congo War in 1998. Within 12 days, the Rwandan-backed forces had made advances toward the Congolese capital, Kinshasa, and would probably have ousted Kabila but for the intervention of Angola and Zimbabwe. Kabila eventually was killed in 2001 by a bodyguard, in what was reported in some quarters to be an assassination masterminded by Rwanda. Two years after his death, the conflict ended. At this time, between three million and 7.6 million people had lost their lives, mostly through starvation and disease, based on figures attributed to the International Rescue Committee (IRC). Kagame has kept insisting he fought both wars in Congo to keep Rwanda safe, but he’s been accused in a number of reports of tapping the mineral resources of Congo and collecting taxes from companies licensed to mine minerals in the east of the country. From the point of view of Rwandan security, Kagame’s strategy appears to have worked. He has not been involved in any foreign war since his country pulled out of Congo in 2009, but it’s hard to think that he doesn’t have a close eye on his neighbors, especially with elections at hand and external interference very likely. Kagame was running for a third term as Rwandan president on Friday, August 4. He wouldn’t have been eligible, but a 2015 referendum that passed with 98.4 percent of the vote allows him to stay in power until 2034, if he keeps being elected—and so he was, with that implausible 99 percent. In the 2003 presidential elections, he racked up more than 95 percent of the vote. In 2010 he garnered 93 percent. No doubt he is very popular, still, among many Rwandans, but in virtually any other country in the world, such numbers would be considered risible measures of tyranny. Despite not having a strong opposition, Kagame didn’t want to take chances. In May, the National Electoral Commission (NEC) published new regulations that required parties or individuals who wish to campaign on Facebook, Twitter, WhatsApp, Instagram, YouTube, or other websites to submit the content for approval to the electoral body two days in advance. But a month later, the decision was reversed after the U.S., the U.K., the Netherlands, Germany, and the E.U. issued strong statements against the restrictions on social media. Elsewhere, it appears Kagame may have done far worse than trying to stop free speech. His opponents have a way of meeting untimely ends at home and even when they flee abroad. As documented by Amnesty International, one—who served as intelligence chief—was strangled in South Africa. Another—who served as cabinet minister—was assassinated in Kenya. Rwandan death squads allegedly have tried to infiltrate Europe. Criticisms can easily be interpreted as insults to the lanky leader, and Kagame wouldn’t accept any of that. When the elections were announced in Kagame’s favor this weekend, world leaders—including those Americans and Britons who often sing his praises—were expected to rush to congratulate him. But as the State Department statement about voting irregularities made clear, even Washington is having its doubts. Now who will actually confront him over the deaths of so many thousands? Who will call him out as the dictator that he is?